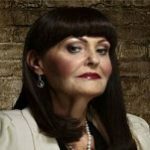 Hilary Devey is an entrepreneur, businesswoman and well known TV personality. As CEO and Chairwoman of Pall-Ex Hilary grew the business from a small start-up to an international freight network, operating across the UK and in 38 countries around Europe. Along the way Hilary earned a host of awards including the Ernst & Young Award in 2007 for UK Entrepreneur (Business Services) and the Vitalise Business Woman of the Year in 2008. Hilary’s success as an entrepreneur saw her featured on Channel 4’s Secret Millionaire, before joining BBC 2’s Dragon’s Den as one of the dragons, where she would dash the dreams of eccentrics and inventors with her signature phrase “You would make my foot itch”. After two years on Dragon’s Den, Hilary worked with Channel 4 to create and host the documentary series The Intern, where young hopefuls were given internships in their dream industries. Hilary also hosted Running the Shop and has appeared in ITV’s Loose Women. As speaker Hilary combines her wit with sharp business instincts to make her an inspiring figure and an inspired choice as a motivational speaker.